Why You Should Start the Year with a Dental Checkup in The Colony! It’s a new year, and you’re excited about the possibilities. Maybe you feel compelled to start a new diet or an exercise regimen, which are two positive endeavors that are worthwhile. In the midst of making these healthy changes, though, your oral health should receive the same attention. 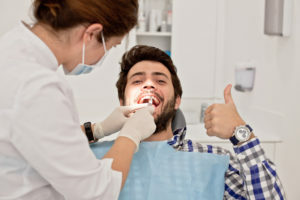 One way to make a positive impact on the condition of your teeth and gums is to schedule a dental checkup in The Colony. Find out why! Many times, the goals that are set for a new year can be lofty, but when it comes to your oral health, small and simple changes can make a huge impact. One area that you can make an improvement in is your consistency in visiting your dentist for preventive care. Harmful plaque and tartar can be cleared away before they can lead to advanced tooth decay and gum disease. Any developing issues can be identified early and addressed before they become greater problems. These visits are typically fully covered by your dental insurance, which provides relief for your wallet. Maintaining preventive care visits is the best way to maximize your investment into your dental insurance. Taking proper care of your teeth and gums has even greater implications than just oral health. Because blood flows from the gums to the brain, heart and to other vital organs, it’s imperative to prevent excessive bacteria growth in the mouth. One way to go about this is to be sure to practice excellent oral hygiene, which should include brushing and flossing your teeth at least two times a day. Consistently following this schedule will ensure that you have less plaque and tartar accumulation, which makes for more pleasant dental visits. As mentioned above, many people start diets at the beginning of a new year with a primary focus on losing weight, but a slight shift in perspective can yield the same results while improving oral health. Instead of focusing mainly on cutting calories, a better objective is to limit the consumption of sugar. By doing so, both very important goals can be achieved. So now that you have a plan for how to channel your enthusiasm, reach out to your local dentist in The Colony to schedule a visit so you can get on track for enjoying a healthy and productive year! Dr. Austin Amos earned his dental degree from the University of Texas School of Dentistry in Houston. Since then, he has stayed up-to-date with the latest changes in dentistry by taking hours of continuing education. Additionally, Dr. Amos maintains membership with such professional organizations as the Texas Dental Association and the Academy of General Dentists. He helps patients maintain excellent oral health at Ridgepointe Dental, and he can be reached for more information through his website. Comments Off on Why You Should Start the Year with a Dental Checkup in The Colony!